Why Should You Care If Your Satellite Link Oscillates? I guess that, like us, you’d expect to find the link hopelessly overloaded, with packets rushing across it nose-to-tail without gaps. You’d expect to see nearly 100% of the link’s capacity in use nearly 100% of the time. So imagine our surprise when we looked at the satellite link utilisation in a couple of locations and found it to be well below 100%. One large island never saw more than 75% even during time periods of just a few seconds, with the average utilisation being around 60%. Another island didn’t tap into more than one sixth of the theoretically available capacity. Looking at the same links, we found that small parts of our data streams were getting wiped ever so often – which is what we would have expected with overloaded links. Let’s use an analogy: Trying to get data from a sender to a receiver through an Internet bottleneck is a bit like trying to pour expensive wine from a barrel into a bottle using a funnel. Think about you & the barrel as the data sender; the bottle is the receiver, and the funnel (at the input of which the wine will bank up) is the satellite ground station where data arrives to be transmitted via the link. The link itself is literally the bottleneck. The goal of the exercise is to fill the bottle as quickly as possible, while spilling an absolute minimum of the valuable wine. To do so, you’ll want to ensure that the funnel (your queue) is never empty, but also never overflows. Imagine that you do this by yourself and that you get to hold the barrel right above the funnel. Sounds manageable? It probably is (unless you’ve had too much of the wine yourself). Bet that filling the bottle is going to take longer with a lot more spillage this way, even if you’re all completely sober? Why? Because your friends have no control over the wine that’s already in the gutter and the downpipe – it’s this wine that causes the overflows. Similarly, if you run out of wine in the funnel, new liquid takes a while to arrive from above. Your funnel will both be empty and overflow at times. 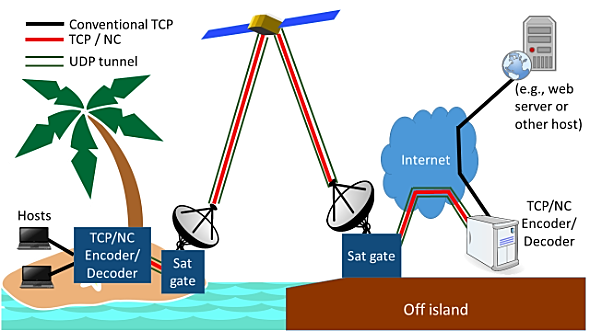 A geostationary satellite link carrying TCP/IP traffic behaves almost exactly the same: The long feedback loop between TCP sender and receiver makes it extremely difficult to control the data flow rate. The fact that multiple parties are involved just makes it a lot worse. On average, users on the island get the impression that the link is a lot slower – and indeed they can access only a part of the capacity they’re paying for and that is being provisioned to them. With satellite bandwidth retailing for hundreds of dollars per megabit per second per month, that’s a lot of money for nothing. The culprit is quite simply the TCP protocol, which controls data flow across the Internet. More precisely, it’s TCP’s flow control algorithm. This algorithm exists in various interoperable flavours, none of which was designed specifically with shared narrowband geostationary satellite links in mind. So, if you happen to live in the Islands, it’s not your evil local monopoly ISP, nor the price-gouging satellite provider, the government, or the fact that you may consider yourself a developing country. In TCP’s defence: The problem it would have to solve here is pretty tricky – as you’ll no doubt find out if you try the wine analogy. Even if your friends on the roof are pretty switched on, they’ll still spill plenty of the stuff. Unfortunately, as you’d find out, using a bigger funnel doesn’t help much (it’d still overflow). Explicit congestion notification (ECN) isn’t really workable in this scenario either, and we don’t want to limit the number of simultaneous TCP connections on the link either. So we need a Plan B. 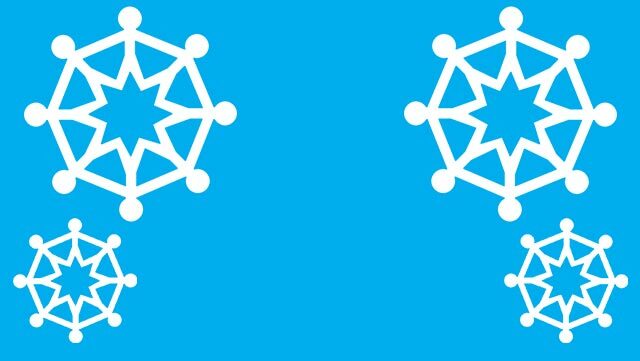 Plan B: Could network coding help? You might also remember that you can solve such a system (find the values of x, y and z) as long as you have – broadly speaking – at least as many equations as you have variables. In network coding, our original data packets are the variables, but what we actually send through our tunnel are the numbers that make up the equations. At the other end, we get to solve the system and recover the value of the variables. As there’s a risk that some of the equations might get lost enroute, we just send a few extra ones for good measure. We build our tunnels such that one end is on the “mainland” and the other on the island, which puts the tunnel right across the point at which we lose stuff (spill the wine or lose equations, as you wish). So how does this help with queue oscillation? Simple: Since we generate extra equations, we now have more equations than variables. This means we can afford to lose a few equations in overflowing queues or elsewhere – and still get all of our original data back. TCP simply doesn’t get to see the packet loss, and so doesn’t get frightened into backing off to a crawl. Yes it does. How do we know? We have two indicators: Link utilisation and goodput. In our deployment locations with severe queue oscillation and low link utilisation, we have seen link utilisation increase to previously unobserved levels during tunnelled downloads. The tunnelled connections (when configured with a suitable amount of overhead) provide roughly the same goodput as conventional TCP under non-oscillating low packet loss conditions. Tunnelled goodput exhibits a high degree of stability over time, whereas that of conventional TCP tends to drop mercilessly under queue oscillation. “So, tell us, how much better are the network-coded tunnels compared to standard TCP?” Let me note here that we can’t create bandwidth, so this question can be largely reformulated as “How bad can it get for standard TCP?” We’ve seen standard TCP utilise between roughly 10% and 90% of the available bandwidth. On the island with 60% average utilisation, we were able to achieve goodput rates across our network-coded TCP tunnel that were up to 10 times higher than those of conventional TCP – during the times when conventional TCP struggled badly. At other times, conventional TCP did just fine and a network-coded tunnel with 20% overhead provided no extra goodput. However, that’s an indication that, strictly speaking, we wouldn’t have needed all the overhead, and a tunnel with less overhead would have performed better at these times. So the trick to getting this to work well in practice is to get the amount of overhead just right. If we don’t supply enough extra equations, we risk that losses aren’t covered and the encoded TCP connections lose data and slow down. If we supply too many equations, they take up valuable satellite bandwidth. That’s also undesirable. What we really want is just enough of them, so we’re currently discussing with the supplier of the software we’ve been using, Steinwurf ApS of Denmark, to see whether they can add feedback from decoder to encoder for us. Written by Dr. Ulrich Speidel with support from Etuate Cocker, Péter Vingelmann, Janus Heide, and Muriel Médard. 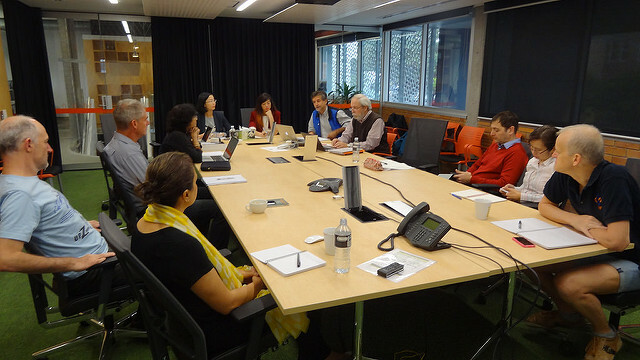 Thanks go to Telecom Cook Islands, Internet Niue, Tuvalu Telecommunications Corporation, MIT and, close to home, to the IT operations people at the University of Auckland for putting up with a whole string of extremely unusual requests!